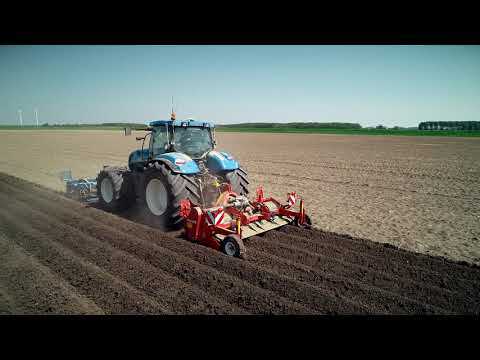 The SC 300 is a cultivator for attachment in front of or behind a tractor. This machine can be installed quickly on the tractor and fits each model. This cultivator guarantees high, reliable performance and excels in regard to the ease of use. With its 650 mm rotor diameter, the SC series has a larger rotor diameter than most other cultivators in the same category. This makes it possible to till deeper for better growing bed preparation, yet still have a compact machine. The special steel used to make the cultivator tines also ensures high durability. Moreover, the powertrain of an SC cultivator can handle the power from engines rated to 250 hp, so it is capable of taking on any type of soil. When used in a front-mounted position, the specially shaped (dis-)mountable ridge formers that are adjustable in height, ensure that the soil is guided towards the ridge to a maximum degree and away from the wheel track without pressing on the soil. This safeguards that there is always a sufficient amount of loose soil to form a good ridge with the planter.